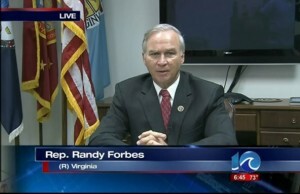 Congressman Randy Forbes (R-VA) was on WAVY TV news yesterday to discuss his opposition to Obama’s proposed strike on Syria. Forbes heads up the 118 member Congressional Prayer Caucus in the House and serves on the Committee on Armed Services and the Judiciary Committee. I have no intention of voting to authorize American intervention in Syria. While the President’s decision to seek congressional authorization for military involvement in Syria shows a regard for the Constitution that has been noticeably absent for much of his presidency, I remain strongly opposed to an action that I believe will in no way contribute to America’s national security interests. I also find it concerning that the President is again seeking to use military power even while he has accepted nearly a trillion dollars in cuts from our national defense over the last four years. The President’s willingness to use our military without ensuring that it is properly funded should alarm all who view the maintenance of unparalleled American military power as a principal Constitutional duty of our Commander-in-Chief.